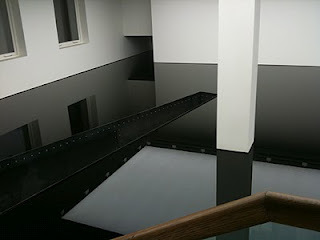 Richard Wilson, born 1953 London, lives and works in London. 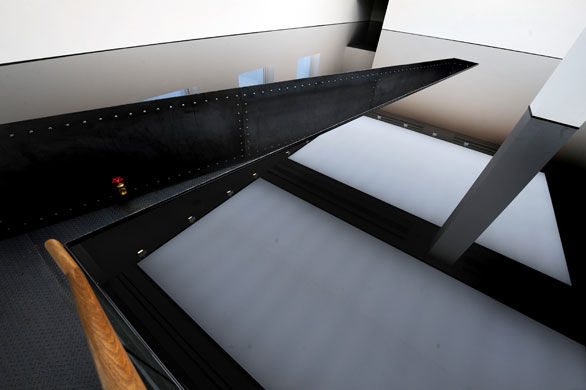 Richard Wilson creates artworks as an installation artist, exploring ways in which the audience experiences and interacts with certain spaces. 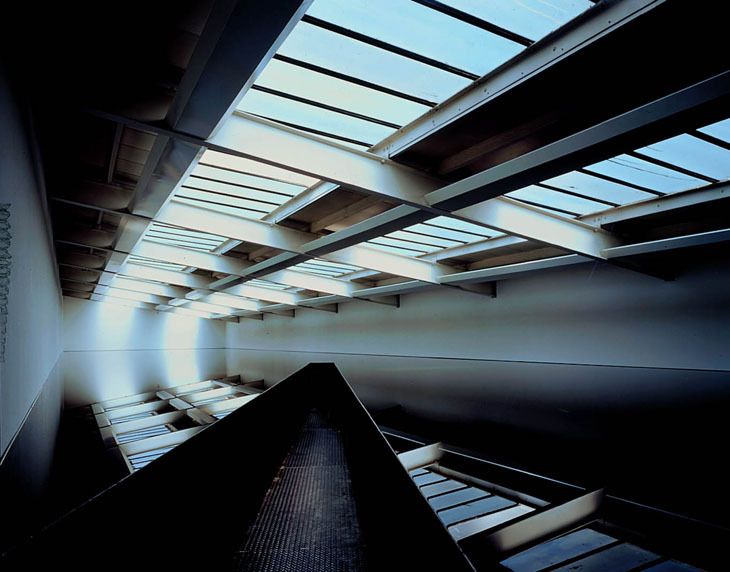 Two of Wilson’s best known artworks are 20:50 (1987) and Turning the Place Over (2007). 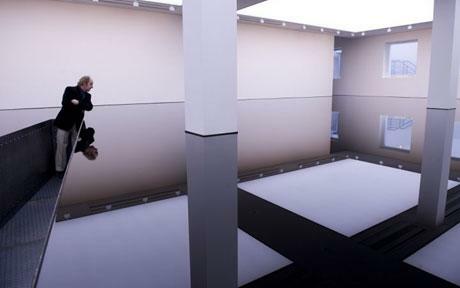 Walking into the installation artwork 20:50 (1987), via a walkway that extends into the space, the audience encounters a room filled with reflections of the surrounding architecture, with a ground that resembles a clear pool, or a highly polished floor that suspends distance and space. On further inspection, the viewer finds out that the floor is in fact covered waist deep in oil. 20:50’s title originates from the type of recycled engine oil used to create the installation. the oil sits still in the space, the audience has to be constantly reminded not to touch it but are invited to softly blow, creating ripples on its surface. Wilson has exhibited the installation in countries such as Japan, America and Australia. 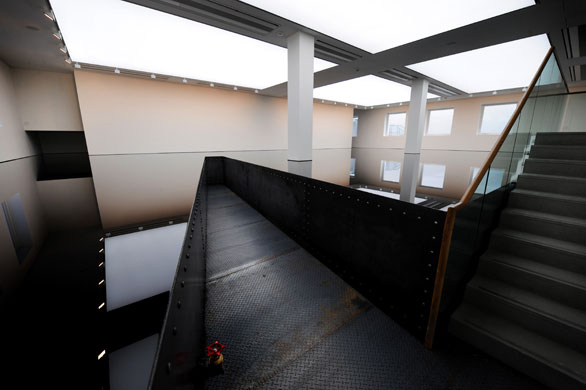 The artwork 20:50 is part of the permanent collection (since 1991) at Saatchi gallery, London, in a custom-built room that highlights the illusionary qualities of the installation. 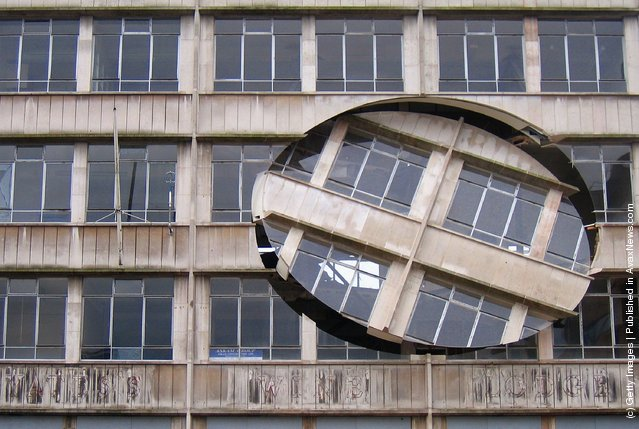 Turning the place over (2007) is a piece of commissioned public art for Liverpool’s European Capital Culture onto a condemned building, the Cross Key House in Moorfields. 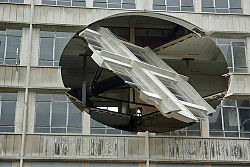 The piece consists of an oval section of the facade of a building that rotates three dimensionally on a spindle still attached to the building’s surface. 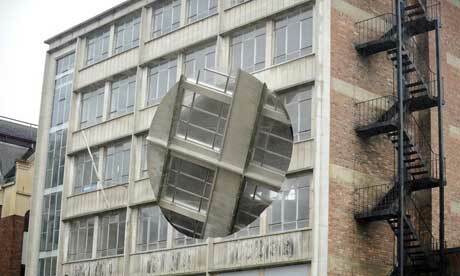 To do so, Wilson had an 8 metre in diameter sphere cut from the walls and windows of the building, reattaching it to a motor that turns the cut out section around on its axle in a two minute cycle. 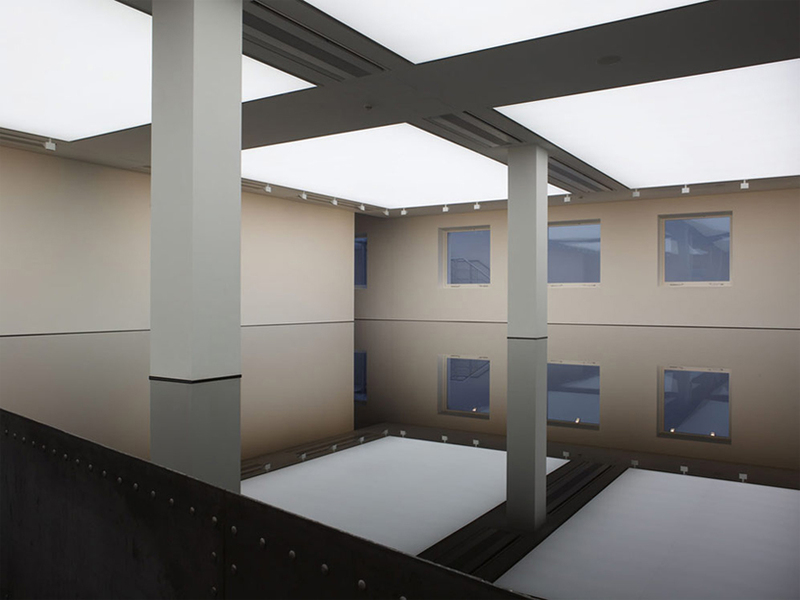 The seemingly impenetrable surface of the oil mirrors the architecture of the room exactly, placing the viewer at the mid-point of a symmetrical visual plane. One of the first people to see 20:50, a man who was delivering paper to the gallery, asked me how he could get downstairs: he thought he was looking into another gallery beneath the walkway. When I dipped my finger through the surface of the oil, his jaw just dropped. The room at Country Hall is wonderful, with loads of light and reflection, and I’ve carefully tuned the work so that from the end of the walkway you can’t quite see the sky above the buildings opposite, but it appears in the reflections. If it goes right, you should feel as if you were falling out into the sky. 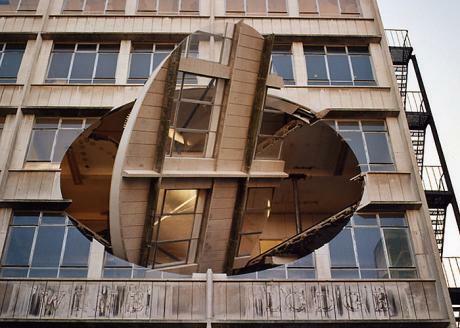 What I actually do is tweak or undo or change the interiors of space and in many instances actually enlist parts of the building as part of the sculpture… And in that way I unsettle or break people’s preconceptions of that space. The idea of a Tardis-like space, where the internal volume is greater than its physical boundaries, had always appealed to me. That was how the idea for 20:50 came about. I’ve always been concerned with the ways you can change architectural space – whether it be a room or a whole building – to alter your perception, to knock your view of the world off-kilter. 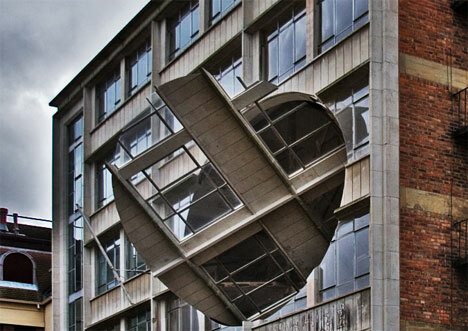 This entry was posted on 27/01/2013 by Emily Portmann in All, Documented Forms, English, Installation, Public Art, Sculpture.